How To Roast A Moist Turkey: Super easy recipe for guaranteed results! I had no idea how to roast a moist turkey when I was first married. That year, my husband decided to invite his entire family to our brand new home to celebrate Thanksgiving. Back then, there was no Pinterest to turn to for advice, no recipe sites to consult. The only place I had to turn was the label on the turkey’s plastic wrapping. Though I followed the directions to a tee, it was an epically tough turkey. It was so bad that we joked about how we’d still be chewing the Thanksgiving turkey on Christmas if I hadn’t made a ham, too. Fortunately, I’ve learned a lot about how to roast a moist turkey in the past couple of decades. Since we like turkey at Thanksgiving, Christmas, and sometimes even for Easter, I’ve had over fifty of them to practice on! Now I’m sharing what I’ve learned with you because no one should have to endure 20 years of her mother-in-law snarking about one bad Thanksgiving turkey. So read on for my tips on how to roast a moist turkey, and don’t miss the perfect turkey recipe at the end! I used to think all there was to roasting a turkey was plopping it in a pan and repeatedly basting until the plastic temperature thingie popped out. That was pretty much my recipe for roasted chicken, too, until I was at a friend’s home for dinner. She made a roast chicken that was so moist I almost forgot about the lovely wine she’d served. (Almost, mind you.) Naturally, I had to ask her secret. Turns out, the key to a roasting a moist turkey is brining, since the salt pulls water into the meat. 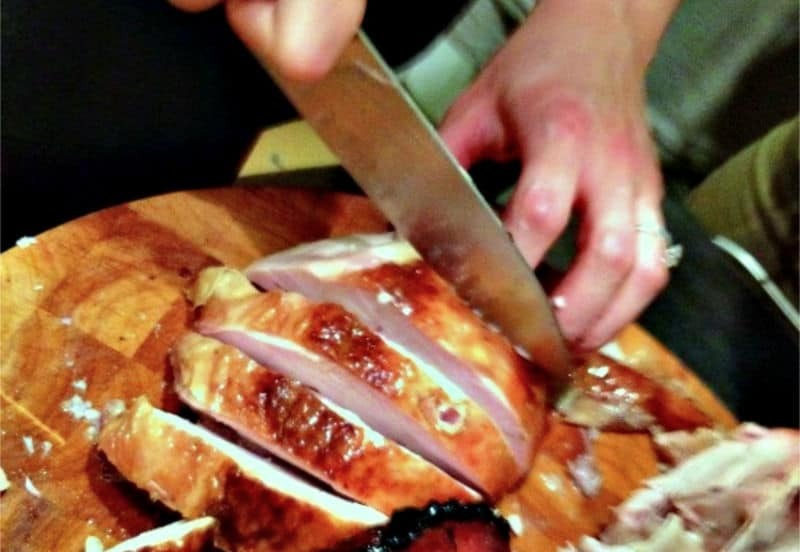 Flavors that you add to the brine will season every bite, elevating your basic bird to one that’s magnificent. As far as flavoring, choose whatever herbs and spices you prefer. Go Cajun-style with garlic, cayenne, and onion, or get a Mediterranean flair with lemon and rosemary. Use whatever flavors you like, but don’t skip the brine! This basic brine will produce the most tender, moist chicken or turkey you've ever eaten. Elevate your meal further using one of the flavoring options below. 1 cup Kosher salt Do NOT use table or sea salt! Combine all ingredients in a large pot over low heat and stir well. Continue to stir until salt and sugar are completely dissolved. Let brine cool to room temperature. Clean a large beverage cooler or line it with a clean trash bag. Rinse the turkey under cold water, inside and out, and place it in the cleaned cooler. Add brine and additional room-temperature water if needed to submerge the entire turkey. Close the cooler or bag. Transfer the whole thing to the refrigerator for at least 12 hours but no longer than 24. Remove the turkey and pat it dry before cooking. Discard brine. Since brining a turkey brings salt and moisture into the meat, its drippings shouldn't be used to make gravy. If you do decide to make gravy from the drippings, use unsalted stock. Butter means never having to baste. The point of basting is to keep the bird from drying out while getting that beautiful golden brown, crispy skin. Since you’re brining the bird, you don’t need to worry about it coming out dry. Plus, your turkey will cook faster because you won’t be losing oven heat when you open the door every 20 to 30 minutes to baste. 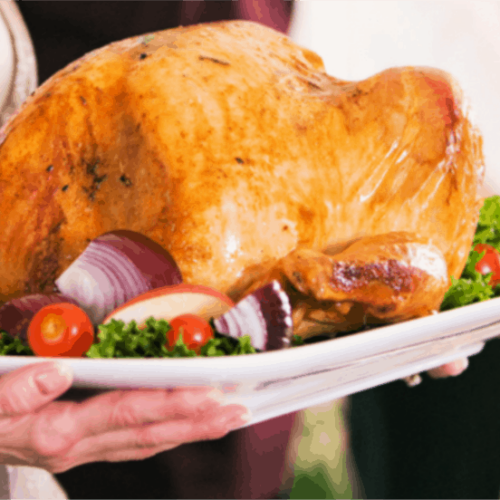 That even, steady temperature helps keep your turkey moist, too! So before putting your bird in the oven, pat it dry with paper towels then slather it all over with a stick of softened butter. Be sure to also cover the wing tips in foil, so they don’t burn. The right pan: Foil roasting pans are convenient, but they aren’t going to give you a perfectly cooked turkey. To do that, you need a roasting rack to raise the turkey, so the bottom of the bird doesn’t sit there stewing in its juices. I’ve used this stainless steel roasting pan for years because it’s sturdy enough to hold even a huge bird, and because I can throw it in the dishwasher after dinner. 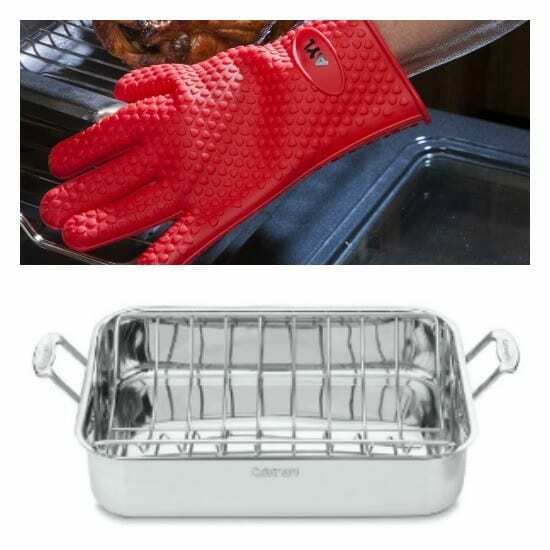 Use the right gloves: No matter what type of roasting pan you use, it’s going to get hot. Very hot. Do you know what happens when quilted cloth oven mitts get the least bit damp while you’re cooking? Your hands get burned, that’s what. (I have a scar on my right hand from ten years ago when that happened to me.) Save your skin: get some heat-resistant oven mitts. I love these silicone mitts and use them while grilling, too. Yes, you need a meat thermometer. Most turkeys come with a plastic button that supposedly pops when it reaches the proper temperature. Unfortunately, those things sometimes pop too early (which you don’t realize until you find pink meat when carving the bird) or too late (which leads to dry turkey). A simple, easy-to-read meat thermometer is only $6, and it will spare you the frustration of an under- or overcooked turkey. Step Four: Give The Bird A Break. The cook is often tired and in dire need of a cocktail few minutes to freshen up before dinner. Guess what? The turkey needs a break, too! Once it’s reached the proper temperature (180°F/82°C in the thigh and 165°F/74°C in the breast), transfer the turkey from the oven to the counter. Loosely cover the top with foil but don’t seal it shut — you don’t want to trap moisture now, or the skin will get soggy. Let the turkey rest at least 20 minutes, and up to 40 for large or stuffed birds. While resting, the turkey will continue to cook another 5-10 degrees depending on the size of the bird. Since the surface is slightly cooling at the same time, the relaxing muscle fibers will begin drawing moisture back into the meat, preserving all that effort you’ve made. The resting phase is also the perfect time to pop your side dishes into the oven. If your family is anything like mine, you may find yourself with more side dishes than oven space. I solved that problem with this 3-tier rack that clips onto the one in the cooker. Depending on the width of your oven, you may even be able to use two at a time. It folds flat for storage. 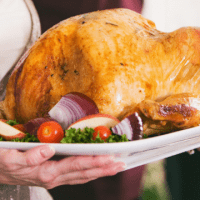 So, you’ve brined your turkey and now want a handy, printable recipe to ensure you don’t forget the other steps? Here you go! A note on rinsing: Until recently, home cooks were advised to clean all poultry to reduce bacterial contamination on the meat. Advice on rinsing poultry changed a couple of years ago due to concerns about cross-contamination. Skip it. Super easy method to roast a juicy, brined turkey while getting that gorgeous, crispy browned skin. Remove the turkey from the brine and pat it dry. (Discard brine.) Place a rack in the bottom of your roasting pan. Put the turkey on the rack. Preheat oven to 325°F while the turkey comes to room temperature. Rub the turkey ALL OVER with the softened butter, making a thick layer. (This layer seals in moisture.) Cover the wing tips with foil and tie the legs together with kitchen twine. Put the turkey in the oven and close the door. Cooking Time Math: an unstuffed, brined turkey needs around 10 minutes per pound to cook, while a stuffed, brined turkey needs 15 minutes per pound. Figure out approximately how much time your turkey will need, and set a timer for halfway through cooking. At the half-way mark, check the bird. If the breast skin looks nice and brown, cover it loosely with a tent of aluminum foil. 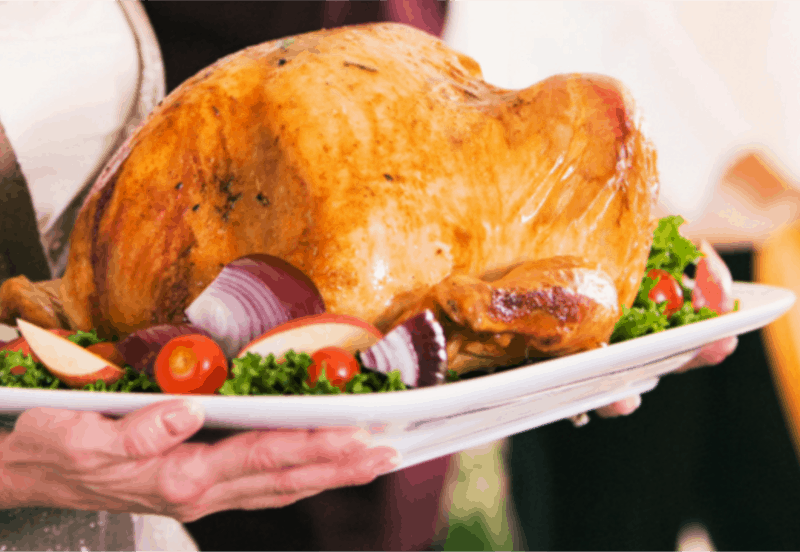 An unstuffed turkey is ready when the temperature is 180° F in thigh and 165° F in breast. If you stuffed the turkey, you must insert the thermometer deeply into the stuffing to make sure it's reached 165° F, the temperature at which it's safe to eat. Remove the turkey from the oven and tent it loosely with a single layer of foil. Do NOT seal the foil -- moisture trapped at this point ruins the skin's crispiness. Let the turkey rest for 20 minutes (unstuffed, birds under 16 lbs.) to 40 minutes (stuffed or larger birds) before carving. Need help carving? Here’s a great pictorial on how to carve a turkey. Want to make some gravy? Keep in mind that the drippings from brined turkey shouldn’t be used. I skip the drippings and use chicken stock in this wonderful gravy recipe that I’ve been using for years — you can even make it ahead of time! Overwhelmed just thinking about it? Check out How To Get Organized For Thanksgiving in 10 Days. I’ll get you sorted! I plan on using a roasting pan but do not know if I should cover it. Also, what are your thoughts on the breast side down comment? What could I expect for a cool time on a brined 20 lb turkey? No, don’t cover until the skin on the breast is browned and then just loosely tent it so you don’t trap steam and destroy the crispiness. (That’s explained in Step 6 on the recipe.) Roasting breast-down to start then turning it over halfway through works, but I’m too lazy to bother. Hello. This really made me feel better to brine my turkey this year. I’m wondering, after doing so, am I still able to season my turkey the Hispanic way (sour orange mix, garlic, oregano, salt, and other ingredients) or the brine And butter is enough? Since I haven’t tried that method, I can’t give you an honest answer. I think if I were trying it, though, I’d add the Hispanic seasonings to the brine, so they get pulled into the meat, then just butter it before roasting. Thank you so much for your post. I have always wanted to try brining our Thansgiving turkey and have been too intimidated to try it. The way you explain it makes it so simple. I think I will try this method with a chicken roaster first and see how that goes! I do it with my chickens every time, now. You won’t need as much brine, though, so maybe reduce the recipe by 1/3. Enjoy! Just made a small turkey as per this recipe. Since I cannot have dairy, I substituted butter for coconut oil. And I used rock sea salt. Also, I always toast my poultry breast-down to make sure all juices run into the breast. This turned out to be the best one of all the turkeys or chickens I have ever made. I nornally hate the white meat and stick with the dark, for myself; this time, I ate the white with pleasure. Note: the gravy turned out to be too sweet to my taste – and also it ended up entirely too salty even for me, possibly because I also rubbed the turkey with salt and spices after brining. (Did not add any salt to the gravy.) I had to throw away the entire vat of gravy I made. I realize the sugar is an essential part of imparting salt into any dish we want to brine, but I wonder if reducing the amount of sugar is possible for this recipe? Or is there some other way to make gravy that I am not aware of? I’m so glad you enjoyed the turkey, but am sorry to hear about the gravy. Since there’s really no way to reduce the amount of sugar in the brine and have the turkey come out the same way, you might want to make a gravy using stock or broth in place of pan drippings. You instructions are the most concise I have seen and thank you for sharing your experience and knowledge. My problem is my hubby hates garlic. He used to eat it and I have told him we need to bring it back into our meals. Having never used brine or made turkey this way, which sounds delicious, can I cut the garlic to maybe 2 cloves and/or substitute another spice do you think? Do you have any recommendations? I just don’t relish eating all the left overs myself. Thank you. Thank you for the kind words, Ginny! You could certainly skip the garlic in this recipe without a problem. The rosemary and lemon combination listed as an alternative brine flavor is wonderful, too, or just use 4 tablespoons of poultry seasoning. Enjoy!